We’d love your help. Let us know what’s wrong with this preview of Max Perkins by A. Scott Berg. The National Book Award winner from the #1 New York Times bestselling author, A. Scott Berg. The talents he nurtured as an editor were known worldwide: F. Scott Fitzgerald, Ernest Hemingway, Thomas Wolfe, and numerous others. But Maxwell Perkins remained a mystery, a backstage presence who served these authors not only as book editor extraordinaire but also as critic, car The National Book Award winner from the #1 New York Times bestselling author, A. Scott Berg. The talents he nurtured as an editor were known worldwide: F. Scott Fitzgerald, Ernest Hemingway, Thomas Wolfe, and numerous others. But Maxwell Perkins remained a mystery, a backstage presence who served these authors not only as book editor extraordinaire but also as critic, career manager, money-lender, psychoanalyst, father-confessor, and friend. This outstanding biography, a winner of the National Book Award, is the first to explore the fascinating life of this editor extraordinaire—in both the professional and personal domains. It tells not only of Perkin’s stormy marriage, endearing eccentricities, and secret twenty-five-year romance with Elizabeth Lemmon, but also of his intensely intimate relationships with leading literary lights of the twentieth century. It is, in the words of Newsweek, "an admirable biography of a wholly admirable man." To ask other readers questions about Max Perkins, please sign up. As a writer, I'm still looking for my Max Perkins. Does such an editor exist today? Alejandro Saint-Barthélemy in a gumdrop house on Lollipop Lane! Писането и леко хаотичната подредба на събитията на места са за 4 звезди. Но тематиката, ах, тематиката свири виртуозно по най-тънките струнки на душата ми. Така че 5 звезди от мен, обективността да върви по дяволите! "Perkins told one of his daughters, “The greatest feeling is to go to bed tired.” Bedtime had always been Perkins’s favorite time of day, those few minutes just before falling asleep when he could “steer his dreams.” In those final moments of wakefulness Maxwell Perkins recurringly transported himself back to Russia in 1812— the scene of his favorite book, War and Peace. Night after night his mind filled with visions of Napoleon’s army retreating from Moscow in the frost and early winter snow. O "Perkins told one of his daughters, “The greatest feeling is to go to bed tired.” Bedtime had always been Perkins’s favorite time of day, those few minutes just before falling asleep when he could “steer his dreams.” In those final moments of wakefulness Maxwell Perkins recurringly transported himself back to Russia in 1812— the scene of his favorite book, War and Peace. Night after night his mind filled with visions of Napoleon’s army retreating from Moscow in the frost and early winter snow. On mornings in Vermont after Tolstoi’s characters had paraded before him, he insisted that his dreams were more vivid and that he slept more soundly in Windsor, his summer retreat, than anywhere else." I had forgotten that there was no developmental editing at Scribner's until Max Perkins arrived in the early 20th century. A lot of the job at that time was simply proof-reading galleys for typos and missing commas. Perkins was the pioneer of developmental editing--i.e. he went beyond grammar & punctuation correction and assisted authors in shaping their work. This was not co-authoring, but showing the writer where he or she could improve their work (including cuts) and sharing ideas for the writers to act on. Unfortunately the era of developmental editing is over. I see it all the time in contemporary fiction and non-fiction---passages and tangents that should be cut and other problems that defend the books from being read. Ура! Бавно се чете, но е много важна и полезна книга, за всеки, който обича литературата. Бърг е хвърлил огромен труд и направил точно това, което Макс Пъркинс заслужава - една голяма и хубава книга. A fascinating story that is about the authors of Max Perkins as much as it is a biography of Perkins himself. I think the book would be of interest to anyone who enjoys biography, but it's also an important read for writers, editors, and students of writing and literature. As for me, the nature of biography is to cover absurd amounts of information, and this biography's nature was especially complicated due to the fact that Perkins lived through his authors and so their stories must be told to el A fascinating story that is about the authors of Max Perkins as much as it is a biography of Perkins himself. I think the book would be of interest to anyone who enjoys biography, but it's also an important read for writers, editors, and students of writing and literature. Тази би0графия е изпълнена с живота на толкова силни (Ърнест Хемингуей), съдържателни (Скот Фицджералд), вдъхновяващи личности (Томас Улф), че на корицата й трябва да има предупреждение: "Внимание: рискувате да изгубите собствената си самоличност в битието на Максуел Пъркинс". Страхотна книга. Страхотна работа на А. Скот Бърг. Успя да ме пренесе в друго време, да ме запознае с друг свят, с други герои и злодеи, различаващи се от днешния. Тази книга я приемам лично. Защото е посветена на човек, за когото само бях чувал бегло, но не знаех какъе еталон е в професията, която съм избрал за свое житейско поприще. Той не е точно “геният” от името на филма и българското издание, оригиналното име е “Макс Пъркинс: Редакторът на гении”, но в своята област определено е човек, достоен за това определение. Защото мнозина с лекота биха казали, че той свети с отразена светлина от Томас Улф, Скот Фицджералд и Ърнест Хемингуей, тримата големи сред десетките, които е открил, окрилил и издал, но сред страниците на “Геният” А. Скот Бърг поставя нещата по различен начин. Писателските портрети не са ласкави в тази книга, не са възторжени и преклонителни, дори напротив – Макс Пъркинс е буквално звероукротител на тия буйни таланти, които имат нужда от него, за да канализират уменията си, да оформят книгите си, да се представят пред читателите и да получат жадуваните слава и признание. И пари, за много пари се говори по тия страници, особено по отношение на широкопръстия Фицджералд, който живее в постоянен недоимък дори след издаването на познатите днес като модерни класики “Великият Гетсби” и “Нежна е нощта”, които се провалят и той не доживява да види тяхното обезсмъртяване. Но няма да ви преразказвам книгата, тя трябва да бъде прочетена – и не, филмът не е достатъчен, той улавя само част от линията с Томас Улф, но не може да предаде дори нея добре. Не казвам, че е лош – просто киноизкуството не е способно да покаже детайлите, а те са толкова важни. Masterful. Everything a literary biography should be. Plenty of supported facts to provide a skeleton and just enough speculation to round out the bony frame without bloating it with wildly improbable and exploitative conjecture. It came as little surprise to learn that A. Scott Berg was a student of Carlos Baker. It has taken me a long time to get around to learning about the man who was instrumental to the successful careers of Hemingway and Fitzgerald. He is quietly fascinating and I was very Masterful. Everything a literary biography should be. Plenty of supported facts to provide a skeleton and just enough speculation to round out the bony frame without bloating it with wildly improbable and exploitative conjecture. It came as little surprise to learn that A. Scott Berg was a student of Carlos Baker. It has taken me a long time to get around to learning about the man who was instrumental to the successful careers of Hemingway and Fitzgerald. He is quietly fascinating and I was very moved by the story of his relationship with Thomas Wolfe. Wolfe is an author that hasn't pinged my radar at all before this but I'm chomping at the bit to read him now. I came to this book at this time in anticipation of the movie based on this book due out this summer. I'm devastated now that I know about Wolfe, to learn that Jude Law will play this role. That's just wrong. Colin Firth as Max doesn't seem like it will work on paper but Colin Firth doesn't work on paper and I've loved everything I've ever seen him in. I'm hopeful. Bibliography about thomas wolfe , who is genius inspired the works of many other authors and also inspired me in different way. he do incredible efforts in writing. Рядко биография се лее по начина, по който се лее „Геният“. Той е малка река на времето. На времето, в което бъдещето е станало част от ежедневието. Бърг майсторски е успял да прелисти живота на един забележителен в своята професия човек без хиперболи и апотеози, а краят на книгата оставя отворен един вечен въпрос – за смъртта на човека/твореца и наследството, което той оставя след себе си. http://kn Рядко биография се лее по начина, по който се лее „Геният“. Той е малка река на времето. На времето, в което бъдещето е станало част от ежедневието. Бърг майсторски е успял да прелисти живота на един забележителен в своята професия човек без хиперболи и апотеози, а краят на книгата оставя отворен един вечен въпрос – за смъртта на човека/твореца и наследството, което той оставя след себе си. Queriendo o no este libro pone en valor la labor del editor y su importancia. Aunque el editor debe estar en la sombra, como decía Perkins, y no en el foco. Te hace preguntarte cómo hubiera sido la obra de grandes escritores sin el trabajo Max Perkins. ¿Hubieran llegado siquiera a la imprenta? I accidentally stumbled upon a book of correspondence between Max Perkins and Marjorie Kinnan Rawlings on a "for sale" shelve at a local library. I wanted something to read during my lunch hour so I popped over to the public library and bought some of their books for a dime a piece. I was not much interested in the book "Dear Max, Dear Marjorie", but, heck, it was a nice, thick hard cover with an undamaged dust jacket for a dime. Those occurrences are called "serendipity". It was a tremendous fin I accidentally stumbled upon a book of correspondence between Max Perkins and Marjorie Kinnan Rawlings on a "for sale" shelve at a local library. I wanted something to read during my lunch hour so I popped over to the public library and bought some of their books for a dime a piece. I was not much interested in the book "Dear Max, Dear Marjorie", but, heck, it was a nice, thick hard cover with an undamaged dust jacket for a dime. Those occurrences are called "serendipity". It was a tremendous find. Not only have I developed an interest in the author of "The Yearling" (a book I never cared to read, but now will) I learned about the man who pretty much discovered and shaped the authors who made the face of 20th century American literature. Max Perkins was the editor for Scribner's Magazine and book publishing company from 1910 until the the day of his death in 1947. Max Perkins: Editor of Genius is a biography of his life. A. Scott Berg deftly describes the life of this stoic, at times eccentric man who discovered F. Scott Fitzgerald, turned Thomas Wolfe (Look Homeward, Angel) into a comprehensible writer, and edited the likes of Ernest Hemingway, William Faulkner, Ring Lardner, and, of course, Marjorie Kinnan Rawlings. In fact, "The Yearling" the story of a young boy in central Florida's "Cracker" community, coming of age and learning about the hardships of life and death while trying to care for a fawn and raise it to a deer was Perkins' idea and at his encouragment, Rawlings wrote the book which won her a Pulitzer and made her world famous. Through this book we see Perkins' relationship with all of these authors and more, and likewise, learn quite a bit about them as well. The book balances Perkins' personal life and professional one, although his professional life often crossed over (he was the father Wolfe never knew; the counselor Fitzgerald desperately turned to as his life fell apart, and Hemingway's drinking buddy.) It was Perkins' patience and encouragement that kept many an author from giving up and all of us benefit as we read the works of these timeless classic writers. For years, Maxwell Perkins has lived in my imagination as an almost mythic literary hero. The Scribners editor famously worked with F. Scott Fitzgerald, Ernest Hemingway, and Thomas Wolfe, among others, supporting them through their struggles and gently pushing them to produce work that continues to be read and studied today. A. Scott Berg’s biography of the man is a remarkable achievement—an intimate, impressively researched work that brings to life not only the shy editor but a score of litera For years, Maxwell Perkins has lived in my imagination as an almost mythic literary hero. The Scribners editor famously worked with F. Scott Fitzgerald, Ernest Hemingway, and Thomas Wolfe, among others, supporting them through their struggles and gently pushing them to produce work that continues to be read and studied today. A. Scott Berg’s biography of the man is a remarkable achievement—an intimate, impressively researched work that brings to life not only the shy editor but a score of literary legends. Quoting from numerous letters, journals, and interviews, Berg takes the reader into the remarkable period when Perkins personally transformed Scribners from a conservative publisher into a house that published the work of bold new writers and helped transform American literature. Unassuming and self-effacing, Perkins nevertheless had a sharp eye for talent, and he was a compassionate and faithful friend who helped writers find the confidence to carry on when their faith in themselves faltered. His unwavering support and consistently wise council were uncommon in the industry and inspired the gratitude and devotion of his writers. The book is a treasure trove of tales about the origins of classic novels, the workings of a publishing house, and the often painful creative process. It recounts Perkins’s efforts to keep Fitzgerald writing when insecurity and alcoholism interfered. It describes the creative challenge of taking Wolfe’s overlong and misshapen manuscripts and, over many months, cutting and shaping them into novels generally regarded as classics today. It was Perkins who encouraged Marjorie Kinnan Rawlings to write “a book about a child in the [Florida] scrub, which would be designed for what we have come to call younger readers.” Years later, in response to periodic encouragement from Perkins, she would write the best seller and Pulitzer Prize–winning book The Yearling. Perkins was a legend even during his lifetime. His dedicated work with Fitzgerald and Wolfe in particular was well-known by other writers who sought his guidance. One of the last books he worked on (but did not live to see published) was From Here to Eternity. James Jones was inspired by Wolfe’s novels to write a book of his own and was encouraged by the stories he’d heard about Perkins to personally deliver his manuscript to the editor. Perkins rejected Jones’s novel but saw in it and in the author himself the promise of something better. Putting his faith in the judgment of the famous editor, Jones set aside his first novel and, over several difficult years, wrote and rewrote a second one partially based on his experiences in the military on Hawaii. Like The Yearling, From Here to Eternity would become a best seller and win the Pulitzer Prize. Berg’s book, his first, won the National Book Award. A film adaptation that focuses on Perkins’s close working relationship and sometimes painful friendship with Wolfe is due in July, with Colin Firth playing Perkins and Jude Law playing Wolfe. I found this book in the least-literary building of the least-literary city I've ever lived in. Seeing as how it was on the building's first-floor communal "it's yours if you want it" table, it had clearly been abandoned, along with some out-of-fashion skiing equipment and scraped-up kitchen kitsch. I had no idea who Max Perkins was, but I grabbed the book when I saw the names Fitzgerald, Hemingway, and Wolfe on the cover, and since I'd had my own preexisting curiosities concerning the editing t I found this book in the least-literary building of the least-literary city I've ever lived in. Seeing as how it was on the building's first-floor communal "it's yours if you want it" table, it had clearly been abandoned, along with some out-of-fashion skiing equipment and scraped-up kitchen kitsch. I had no idea who Max Perkins was, but I grabbed the book when I saw the names Fitzgerald, Hemingway, and Wolfe on the cover, and since I'd had my own preexisting curiosities concerning the editing those writers' novels had received, I decided to keep the book and add it to the mad stack I've toted around the country for the past year. A month ago I read some Hemingway -- "A Moveable Feast" -- and it whetted my taste buds for more on that golden age of literature, so I cracked open this unlikely page-turner and ended up tearing through it like a tornado doing its best to uproot the skyscrapers of Manhattan. I now at least have a name for the nameless angel I have always pined for: Max Perkins, Patron Saint Of Good Taste And Earnest Praise And Useful Feedback. A. Scott Berg did a truly fine job with this biography. The writing flows, the extraordinary research shows, and on the Zarathustran tightrope, the reader got to see Perkins the God and Perkins the Monkey. The existence of both, and the truth of both, underscores the truly complicated nature of human existence, and is something to consider in a time when self-righteous other-hatred is all the literal rage. To me something that wasn't even mentioned in the book is illustrative of not only Perkins' integrity and genius, but of the fundamental paradigm-shift that has taken place in America and the West. What is mentioned in the book is how Max's wife came to be friends with a famous Hollywood actress, I believe it was Katherine Hepburn, and how Max never even spoke to her, for fear of impropriety, let alone asked her to write a book. He was an editor for a profit-seeking publisher, and he never needled a famous actress to write a book that would certainly sell to at least her fans. I've often made the observation that in the 20th century a book created a celebrity, whereas here in the 21st century a celebrity creates a book. "Геният" ме придружаваше всеки ден в автобус №120 в продължение на доста дни, за което съм изключително благодарен на мистър Бърг. Направи дните ми далеч по-поносими. Макс Пъркинс - открил за света Фицджералд, Хемингуей, Томас Улф и много други - е наистина личност, за която си струва да си чете и пише. В книгата има страшно интересни неща за едно страшно интересно време в литературата, а вярвам и немалко вдъхновяващи примери. 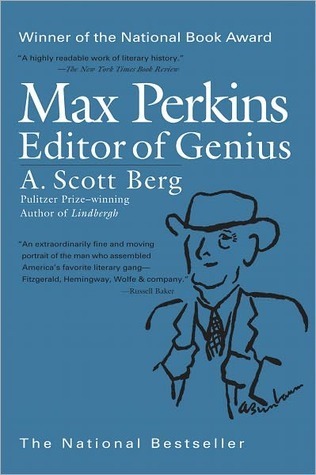 Max Perkins was the Scribner's editor during the golden age of American Literature. His clients included Ernest Hemingway, F. Scott Fitzgerald and Thomas Wolfe. This is an outstanding work, well-cited and researched. I just loved it. If you are a fan of Thomas Wolfe, F. Scott Fitzgerald and/or Ernest Hemingway, you need to read this book for insight into each man, the times they lived in, their challenges and successes, their climb to fame, and relationship with this incredible editor who helped guide their words to greatness. Thank you so much for your effort to write this book A. Scott Berg. Really well done! Наистина е мащабно проучване, но не ми допадна особено. Раздвоена съм – от една страна ми беше изключително интересно да чета за редакторската работа и творческия процес на Фицджералд, Хемингуей, Томас Улф (последният не ми е познат, но смятам да прочета единствената му издадена книга в България), подробности за личния им живот, за начина им на работа, за черти от характера им. Но всичко e някак хаотично – разказът прескача от един проект на Макс Пъркинс към друг, от един негов автор на друг, бе Наистина е мащабно проучване, но не ми допадна особено. Раздвоена съм – от една страна ми беше изключително интересно да чета за редакторската работа и творческия процес на Фицджералд, Хемингуей, Томас Улф (последният не ми е познат, но смятам да прочета единствената му издадена книга в България), подробности за личния им живот, за начина им на работа, за черти от характера им. Но всичко e някак хаотично – разказът прескача от един проект на Макс Пъркинс към друг, от един негов автор на друг, без някаква логическа връзка, освен може би хронологична. Самото изложение прилича на нещо между календар с години и събития, представени чрез твърде много цитати от писма, смесено с не особено важни епизоди и ежедневни случки от личния живот на Макс, с добавка от може би сензационни факти за живота на известни писатели. Освен това личността на Пъркинс почти не се разкрива, той присъства някъде на заден план, като фон на големите писатели и мъките по създаването на техните творби. Ясно, че такава е редакторската работа, но това все пак е книга за редактора и е очаквах неговият живот, преживяванията и емоциите му да са водещи. Намирам епизодите, свързани с Томас Улф за особено привлекателни, може би защото авторът ми е напълно непознат. Чрез неговата история се вижда какъв къртовски и неблагодарен труд може да е редакторската работа и какви забележителни качества се изискват, за да се отсее семето от плявата, да се сглоби книга от всичко, което някой иска да изрази чрез писането си. Напоследък избягвам да чета книги над 600-700 страници, но разбирам, че има автори, които имат нужда да се разпростират и да се иразят чрез океан от думи. Не съм длъжна да ги чета, разбира се. October 2016, update: Although the movie includes a Hemingway cameo and scenes with F Scott Fitzgerald, it centers too much on Thomas Wolfe. Nonetheless, this was a good, literate period piece about writing as well as book editing and publishing in the twenties, bringing the book to life. A Scott Berg, the author of the book, discusses the transformation from page to screen in an interesting special feature on the DVD. A very-well written biography of Max Perkins, October 2016, update: Although the movie includes a Hemingway cameo and scenes with F Scott Fitzgerald, it centers too much on Thomas Wolfe. Nonetheless, this was a good, literate period piece about writing as well as book editing and publishing in the twenties, bringing the book to life. A Scott Berg, the author of the book, discusses the transformation from page to screen in an interesting special feature on the DVD. A very-well written biography of Max Perkins, who became a major force in the world of books as a book editor unknown to the general public. He was a quality guy. By the mid-forties, book editing no longer meant spelling and punctuation. It also meant knowing what to publish, how to acquire it and then how to attract readers. Perkins arrived in 1910 at Scribner's, a genteel and traditional publisher. He edited more boldly than any editor before him at Scribner's. Perkins worked standing up at a special desk. Hemingway and other writers in the stable liked Perkins' eye and ear. Scott Fitzgerald, in 1925, wrote Max to thank him for fixing the structure of "The Great Gatsby." Perkins and his sweeping changes led Scribner's to leap from the earlier age of innocence to the modern lost generation, those who came of age during World War I.
I found the first hundred pages quick, interesting and fascinating, but the deep detail took its toll on me over the remaining three hundred pages. Andrew Scott Berg arrivò a Perkins seguendo i passi di Fitzgerald, il suo scrittore preferito. Ripercorse la vicenda editoriale di Gatsby, il romanzo che lo ossessionava dall'adolescenza, e incontrò il nome di Perkins. Capì subito che l'editor fu una presenza fondamentale nella vita professionale e personale di Fitzgerald. Poi lo ritrovò nei libri di Hemingway, a lui lo scrittore dedicò la prima edizione del romanzo Il vecchio e il mare. Berg decise che la storia di Perkins, di quel mito d'Ameri Andrew Scott Berg arrivò a Perkins seguendo i passi di Fitzgerald, il suo scrittore preferito. Ripercorse la vicenda editoriale di Gatsby, il romanzo che lo ossessionava dall'adolescenza, e incontrò il nome di Perkins. Capì subito che l'editor fu una presenza fondamentale nella vita professionale e personale di Fitzgerald. Poi lo ritrovò nei libri di Hemingway, a lui lo scrittore dedicò la prima edizione del romanzo Il vecchio e il mare. Berg decise che la storia di Perkins, di quel mito d'America, sarebbe stata materia per la sua tesi di laurea, un testo che ha pubblicato nel 1978 vincendo il National Book Award. Max Perkins faceva errori di spelling, sosteneva un uso personale della punteggiatura, svincolato da ogni regola formale, ed era molto lento a leggere, «lento come un bue». Ma per lui la letteratura era questione di vita o di morte. My main problem with this book is the fact that it was supposed to be a book about Max Perkins, and yet there is so little aboiut him in it. This book is full of interesting stories and anectotes about the greatest wrters of that time - Fitzgerayld, Hemingway, Wolfe, Galsworthy. It's a fascnating book for every one who's a fan of said authors. Those stories overshadow everything else though, and you're left fith the feeling that now you know almost everything about Fitzgerald and Hemingway, and c My main problem with this book is the fact that it was supposed to be a book about Max Perkins, and yet there is so little aboiut him in it. This book is full of interesting stories and anectotes about the greatest wrters of that time - Fitzgerayld, Hemingway, Wolfe, Galsworthy. It's a fascnating book for every one who's a fan of said authors. Those stories overshadow everything else though, and you're left fith the feeling that now you know almost everything about Fitzgerald and Hemingway, and close to nothing about Perkins. Haven't had a lot of reading time lately but I was determined to finish this excellent biography. Berg captures the humanity of the legendary editor Perkins as well as the legends he discovered: F. Scott Fitzgerald, Ernest Hemingway, Thomas Wolfe. The book is also provides an inside look at the publishing industry at the time. Some things have changed but much is interestingly the same.